There’s not many things a a parent won’t do for a child. Take me and my husband, for example. This week we worked diligently to provide an eight inch square section of a yellow jacket nest for our child to take to Show and Tell on his first day of school. The nest even had a live yellow jacket still in the bag with it, buzzing around angrily for close examination. Not just any parent can pull that off. I started the search for this amazing item by putting in a perimeter fence along the property line. I planned to do the fence in the winter when the woods weren’t full of snakes, spider webs, and ticks. But if my kid needs a splash to start the school year in July, an incredible Show and Tell item that will shoot him to popularity, then who am I to argue? Also, the neighbor was threatening to shoot my ducks if they kept eating the corn out of his deer feeder (Really? Feeding the deer on purpose? Who does that???). So it worked out for both of us. To avoid damaging the nest, I did not hit it with the T post I was driving into the ground. Instead, I carefully stepped repeatedly on the entrance hole to the nest as I walked back and forth between the woods and the driveway for fencing and tools. When I had sufficiently provoked them, the yellow jackets charged me in a steady stream, revealing the nest’s hidden location. Aha! Just as I had planned. During their first attack, I ran screaming around the driveway, stripping off my clothes and trying to pull out my hair in order to further antagonize the swarm. My hope was to determine if the nest was large enough to collect for school. If it was just a little nest, it was not worthy of show and tell. We’d need to move onto something more impressive like trying to trap that snapping turtle in the pond that can bite through a stick 4 inches thick. Luckily, the nest appeared to be large enough to support a swarm of 100’s of healthy yellow jackets. So vigorous that they managed about 11 stings to my body in less than 10 seconds. So hearty that they crept through my sleeves and pant legs without any difficulty at all. Excellent. With the first step of obtaining the nest completed, I retired to the shower for a good cry, I mean, contemplation of Step 2. A little hand slipped into the shower with a bowl of baking soda and water mixed into a paste. And maybe some leftover corn flakes in it. “Do you think you could get that yellow jacket nest for me, Mom? I’d really love to see it. It would be cool to take to school.” Of course, it would be. Getting that yellow jacket nest for you has been my plan along. You don’t think I hit that yellow jacket nest just because I was stupid enough to dig post holes in the woods, in the leaf debris, in July, do you? Please. Because a marriage is a partnership in which each person joyfully offers the other support and embraces opportunities to be involved in the raising of the children, ( I know, funny, right?) my husband arrived home for next part of the operation. Step 2.–the spraying of the nest. Now before you accuse me of cowardice, you should know that I was not afraid to spray the nest. It’s just that my vision was a bit off from the sting that caused my left eye to be almost swollen shut. Besides, asking a man to spray a bees’ nest is like asking him to burn something. It fills a deep, primal need inside him. Why would I deny my husband such a fulfilling experience? Armed with a flashlight and some hornet spray, we advanced upon the nest after dark. Initially, my husband had some difficulty locating the entrance of the nest. Apparently the light from the flashlight was pretty weak by the time it stretched from where I was standing on the deck to his spot at the edge of the woods. I would have stood closer but I had to be next to the door in case I had to dash into the house for safety. I mean, in case one of the kids called for me. Eventually he took the flashlight, too, shining it on the ground while employing my technique of stepping on the entrance of the nest until it released a torrent of angry yellow jackets, thereby revealing its location again. It’s really a very effective strategy. Again, the hive demonstrated it’s size by managing an impressive number of stings before showing any impact from the poison spray. I’d guess my husband was stung eight or nine times, although it was hard to tell from in the house behind the storm door. With the can empty and the nest sprayed into submission there was nothing to do but go to bed and wait until morning. After applying more baking soda paste to our stings. The morning sun revealed silence over the nest. We turned over the leaves and ground around the entrance with a shovel. We ran away quickly. Even from the deck we could see the nest was large. Easily 12 inches long and shaped like a football. With pride we broke off a piece, placed it in a large ziploc bag, and went inside to print off a fact sheet about yellow jackets. Did you know that yellow jackets are most aggressive in late summer when their food supply is dwindling, so you should avoid their natural habitat as much as possible during that time of year? Did you know you should walk slowly away from a swarm of yellow jackets, never run, as they are instinctively drawn to a fleeing object? (OK, how was this tested? Did someone actually walk calmly away from a swarm of yellow jackets? Do you believe that??) 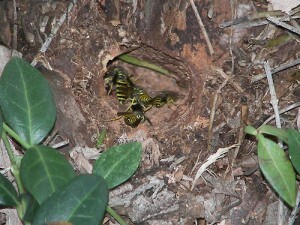 Did you know that you should never shine a bright light at a nest after dark as yellow jackets are drawn to the light? Go figure. Jeez. I forgot there were so many city people working in the public school system. Now that is impressive and loving parenting! I can’t believe the teacher threw it away! Love it. Reminds me of the time my nephew (then in 2nd grade, I think) wrote about what he did on summer vacation. Evidently the fishing was OK. The hunting stories however…. school wasn’t sure whether to bring in the animal right folks or a team of shrinks. Thanks for this. Great blog.